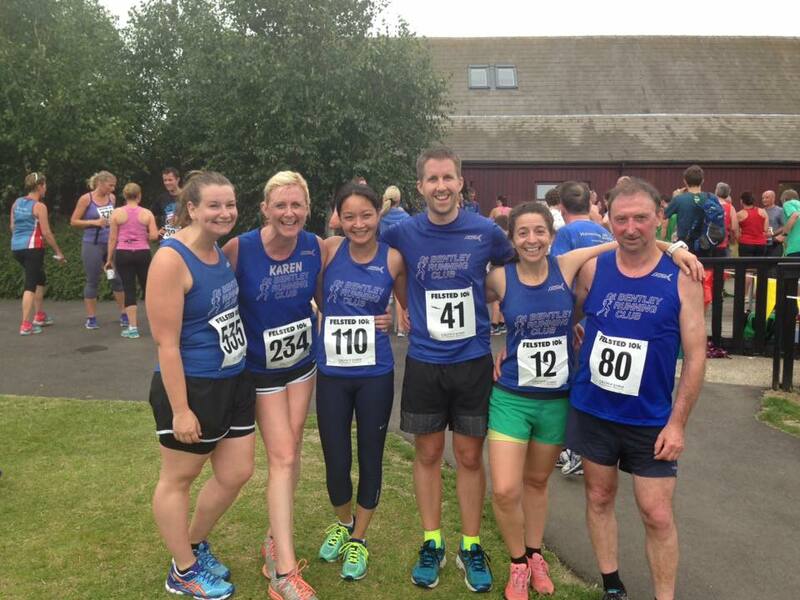 This week’s race report starts on Tuesday which saw Harwich Runners host the fourth and penultimate race in the Harwich 5k Series (handicap). Rita Page was the first Bentley runner to cross the line, finishing in 35:32 and ninth position. With just one race to go Rita is currently in 6th position in the ladies’ points table. Second home for Bentley was Cherie Hipkins (27:26), who was the 14th finisher. Frank Gardiner (23:37) also finished in the top twenty. Alison Clarke finished in 22nd position with a time of 26:38, twenty seconds faster than her time from the previous race, and her fastest in the tournament so far. Stuart Baggs has completed all four of this year’s races. This week he finished in 34th position with a time of 28:09. Kevin James (41st, 22:14) ran 16 seconds faster than his time from race three. Then came a sea of Bentley blue as five Bentley runners finished in the space of 14 positions: John Bush (65th, 28:07, his best time of the series so far), Sandra James (69th, 31:54), Brian Telford (71st, 23:35), Ray Baggs (74th, 19:41) and Graham Clarke (78th, 22:28). Gary Hill finished in 86th position with a time of 25:03. Just one position behind him was Barbara Law (30:24). Louise Reeve (102nd, 29:35) and Dave Nugent (112th, 44:05) completed the Bentley representation. Louise is currently sitting in 10th position in the ladies’ points table. The fifth and final race takes place on Tuesday 26th July. Saturday saw a Bentley runner complete an ultra-marathon. 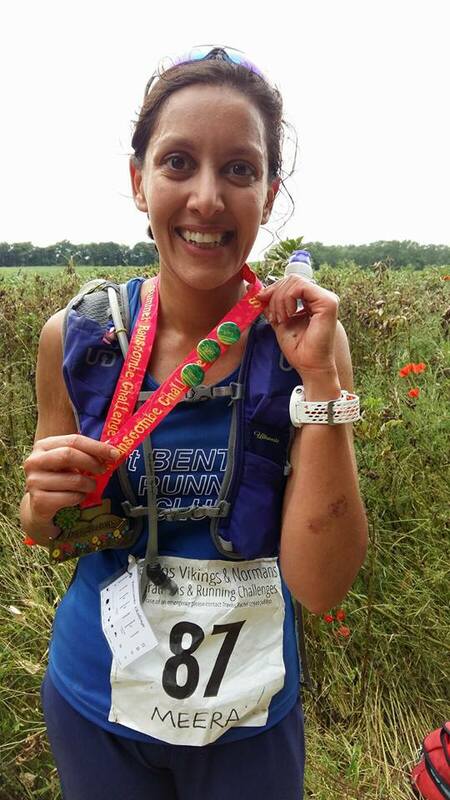 Meera Rajoo-Oakley completed the Ranscombe Summer Challenge. The challenge consisted of laps around a 3.8 mile loop in what the website described as a ‘beautiful rural reserve on rolling chalk downland trail amidst an array of wildflowers, wildlife and views over North Kent and the Medway’. It also warned ‘it isn’t flat’. Meera completed an incredible 9 laps (39.6 miles) in 7:47:36. Only one other runner managed 9 laps, and Meera had the faster time. Her effort earned her a winner’s badge, as well as the standard enormous medal. Saturday also saw the usual parkrun pilgrimage of Bentley runners. This week there was quite a club presence at Harwich parkrun, where Claire Groves was first female finisher in an impressive 22:28. Paul Hollidge once again ran within 30 seconds of his sub-20 target. Paul finished with a time of 20:29 in 7th position overall, first in his age category and just five seconds away from a PB. Just 10 seconds behind him was Harwich parkrun regular Malcolm Jarvis in 8th position (20:39). Kevin James, another Harwich parkrun regular, finished in 28th position in 25:25. Sue Wright and Luke Groves both broke the 30-minute barrier with 29:11 and 29:38 respectively. Also breaking the 30 minute barrier was John Ferdinand, who finished in a 5k PB of 29:37. Lee Clarkson and Chusa Batis also ran the 5k along Harwich Promenade, but both taking it easy as they were running the Felsted 10k the next day. Lee finished in 25:50 and Chusa in 27:57. Ten Great Bentley runners took on the undulating delight that is Colchester Castle parkrun. Vicky Presland was first female finisher in a very respectable 20:19. Vicky has only run the event in Castle Park eight times and she has now been first female finisher on four occasions. The first Bentley male to cross the line was David Wright (18:24), with a season’s best time and finishing in second position overall. Colchester Castle also saw a couple of Bentley runners returning from injury. Rachel Giles completed the 5k course in 25:16 and Richard Moor, who rattled off an impressive 20:51 to finish in 21st position overall. Lorna Sharp ran the course for the second time and finished with exactly the same time as her last attempt in 24:31. Louise Reeve ran her second 5k of the week, completing the course in 30:57. Just a few seconds behind Louise was Shawn Leek, who finished in 31:06. The Bentley representation at Colchester Castle parkrun was completed with Andy Stephens (24:45), Claudia Keitch (27:32) and Alison Clarke (29:41). Meanwhile Katy O’Leary became only the second Great Bentley runner to run Newark parkrun (the other being Richard Moor back in February 2015, before he joined the club). Katy completed the route in 25:35. On Sunday Rebecca Conran competed in the Vitality British 10k in London. The route passes through the city and allows runners to take in the many famous landmarks of London including Trafalgar Square, Big Ben and the Houses of Parliament, St. Paul’s Cathedral and Buckingham Palace. Sunday also saw eight Bentley runners take part in the Felsted 10k. First across the finish line was Simon Miller (44:07). Second to finish was Chusa Batis with a time of 48:55, which earned her both a place in the club championships and a silver standard. Lee Clarkson crossed the line just behind her in 48:56. The other Bentley runners were Frank Gardiner (51:13), Hien Hoang (51:59), Karen Skene (52:54), Louise Upston (60:10) and John Bush (66:09). Sunday morning saw a good turnout of Bentley juniors at Colchester Junior parkrun. Megan Hughes knocked 1:34 off of her 2k PB when she finished in 10:20, earning her a place in the club championships. Megan’s sister Chloe also achieved a PB, finishing in 16:38. Hot on Chloe’s heels was Yasmin Leek (16:47). Caitlyn Hughes (13:02) and Harrison Leek (8:31) also put in solid performances. That concludes this week’s race report. The coming week promises to be an exciting one, with the concluding race of the Mickey Edwards Series on Wednesday and the Ekiden Relay on Sunday. Good luck to all running this week.